We evaluated wheelchair van companies based on our expert-guided buying criteria: ratings from independent companies, cost, customization, quality and reliability, and customer reviews. BraunAbility carries new conversions on pre-owned vehicles starting at $29,900, wheelchair vans with both side and rear entry, SUVs with side entry and a large selection of certified pre-owned wheelchair accessible vehicles. VMI’s wheelchair van lineup includes four minivans and one SUV, all with Access360 interior space providing 360 degrees of maneuverability for a wheelchair. With Access360, each vehicle has 59 inches of headspace. Instead of converting vans made by other vehicle manufacturers, Mobility Ventures makes their own vehicles with wheelchair access built into the design from the ground up. It offers customization options for color, wheels, window tint, restraint systems and jump seats on all three of their MV-1 wheelchair vans. We evaluated 15 wheelchair van companies and selected the three best choices after carefully researching each one. We stacked their ratings from independent companies, cost, customization, quality and reliability, and customer reviews against each other for our evaluations. Our choices for the best wheelchair van companies are BraunAbility, Vantage Mobility International (VMI) and Mobility Venture (MV-1). 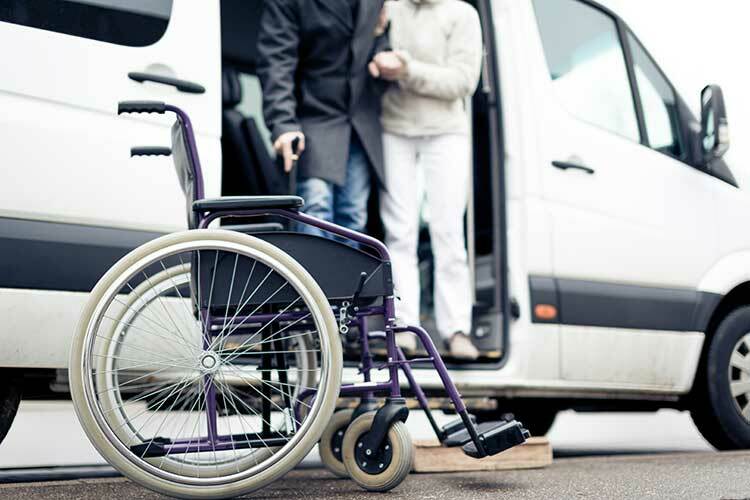 In this guide, we will discuss types of wheelchair vans and SUVs, share tips for choosing one to fit your needs along with our detailed evaluations of the top-rated wheelchair van companies. You will also find helpful frequently asked questions about these vehicles later in this guide. Finding a mode of transportation that works seamlessly with your or your loved one’s wheelchair makes getting around or aging in place more convenient. Whether you buy a van converted at the manufacturer, add a conversion kit to a minivan, or a used van that’s been converted to a wheelchair van, shopping around and having a clear idea of what you need can save time, money and problems down the road. Purchasing a wheelchair-accessible vehicle can be intimidating, but they offer so much freedom that it’s worth taking the time to know what you’re looking for before heading to a dealership. Researching, planning and having patience with the wheelchair van buying process one step at a time will help you overcome feeling overwhelmed. Another advantage to taking your time choosing a wheelchair van is that it can keep you from having to make costly and time-consuming design revisions once you get it home. Wheelchair vans are basically modified “regular” vans that you’d see at a dealership. With that in mind, you’ll be paying for the cost of the van plus the cost of the modifications it takes to make it wheelchair accessible. Wheelchair van conversion prices range from $10,000 to over $20,000 on average, depending on the type of wheelchair access you need, the technology you want and the type of van you bought. For example, a Dodge Grand Caravan costs around $27,000 new. Converting it to a wheelchair accessible van puts the total at around $37,000 to $47,000. MV-1, one of the wheelchair van companies we review in this guide, makes its own vans rather than converting another make and model of van. The cost of their vans is on par with other vans that have been converted. You can always shop for used wheelchair vans which significantly reduces the price due to the depreciation of the vehicle. Where you are going to park is a big factor in choosing a new wheelchair van. Whether you select side-entry or rear-entry is impacted by your parking spot or the width of your garage. Something as simple as curb height can influence your choice when deciding between a fold-out or an in-floor ramp. Even more so than regular vehicles, preventive maintenance is an absolute necessity for the safe operation of a wheelchair van and its accessibility components. Complex equipment with hydraulic or electrical components usually requires more frequent maintenance and repair. It’s wise to plan for biannual inspections by a dealer licensed by the National Mobility Equipment Dealers Association (NMEDA) with yearly maintenance costs estimates between $2,900 to $3,500. 1. We searched for an extensive list of 15 companies. 2. We evaluated wheelchair van companies based on our expert-guided buying criteria: ratings from independent companies, cost, customization, quality and reliability, and customer reviews. 3. We provided you with the best wheelchair van companies for consideration. Wheelchair vans and SUVs can be purchased fully converted, or you can buy a suitable vehicle and have it converted for your needs. The various makes and models have different options based on the manufacturing process for the vans. With so many options and variables, knowing where to start your search can be daunting. We did the hard work for you. Our in-depth wheelchair van analysis focuses on each company’s industry reputation, the variety of vehicle models and other criteria. We researched the top 15 wheelchair van companies. We narrowed the list to our top three picks based on specific criteria set after studying government and consumer information on mobility accessible vehicles. We considered the benefits of a wheelchair van right after you buy one and the advantages later on. The result is our list of the three best wheelchair van companies. After our evaluation, we chose the three best wheelchair van companies. Each of these companies stood out above and beyond the competition. Founded in 1973, BraunAbility has been manufacturing wheelchair vans, SUVs and commercial vehicles for nearly 50 years, making them a pioneer in the industry. The company currently offers 23 models of handicap accessible vehicles that all live up to the legacy left by founder, Ralph Braun. Mr. Braun developed the first wheelchair lift and installed it in an old postal Jeep. Selling these lifts led to the establishment of the Braun Corporation in 1972. Ralph Braun died in 2013, but his vision and values live on through BraunAbility. At BraunAbility you get one-on-one support from a mobility specialist, and BraunAbility is the only U.S. wheelchair van manufacturer with a dedicated financing service. Once you have a handle on what you need and how much you can afford, the lineup of offerings is extensive. Many models include touring, limited and sports models. BraunAbility wheelchair vans range in price from $45,000 to over $67,000 total depending on the model of van and modification package. VMI, or Vantage Mobility International, began when the founders were challenged to find a better a better handicap-accessible vehicle for a close family friend. The company introduced their first wheelchair-accessible Chrysler minivan in 1987, and they have been producing and selling wheelchair vans ever since. The company’s line includes domestic and import minivan conversions, full-size van conversions, platform lifts, scooter and wheelchair lifts. Headquartered in Phoenix, Arizona, VMI has authorized dealers in every state except South Dakota as well as locations in eight other countries. With this wide distribution of dealers, getting a van serviced is usually convenient. VMI wheelchair vans cost around $35,000 to over $60,000 total depending on the wheelchair accessible modification package you want. Mobility Ventures is part of the AM General group that started in 1903 and went on to develop the Jeep during World War II, and later the Humvee. Mobility Ventures’ MV-1 wheelchair vehicle is in a class by itself, meeting or exceeding Americans with Disabilities Act (ADA) guidelines right off the assembly line. The MV-1 is the only vehicle on the road today built from the ground up for wheelchair accessibility. MV-1 owners can customize a vehicle to suit their needs, starting with selecting one of four models. The base model, MV-1 SE, is priced starting at $39,800. The luxurious high-end MV-1 LX costs $56,995 before options. You can customize each model by choosing the color, wheels, level of window tint, restraint systems and more. Many of the standard features on the DX and LX MV-1 models are available as options on lower-level models. Each MV-1 has an extra wide side entry. Is there any financial assistance available to help purchase a wheelchair van? Check with your state Vocational Rehabilitation Program, the VA if you’re a veteran, charitable organizations and churches, and organizations that offer grants for various disabilities. BraunAbility can give you a list of grants grouped by the state to get started. Some vehicle manufacturers offer rebates for accessibility modifications, so ask your dealer about this. Which of these wheelchair van companies has the best warranty? BraunAbility, Mobility Ventures and VMI all offer a three year, 36,000-mile warranty. MV-1’s warranty is bumper-to-bumper including the ramp and includes 24/7 roadside assistance and rust-through protection. The model year 2015 and 2016 vehicle warranties also cover the powertrain and ramp with a five year or 60,000-mile warranty. Can I buy a minivan and have it converted into a wheelchair van? Either BraunAbility or VMI can work with your dealer to ensure you buy a van with the options needed to be a candidate for conversion. I already have a van. Can I add a wheelchair ramp to it? No. Much more goes into building a wheelchair accessible van than merely adding a ramp. Teams of skilled technicians work together to create the lowered floor and reconfigured seating in a converted vehicle. What happens to a minivan when it’s converted into a wheelchair van? A wheelchair van conversion starts with a lowered floor replacement. In the process, the brake lines, fuel lines, exhaust and electrical systems get modified. The vehicle’s ground clearance may become lower to provide necessary headroom, which can cause issues with speed bumps, curbs and uneven pavement. However, there have been thousands of successful wheelchair van conversions. You could also consider the MV-1, which is manufactured specifically for wheelchair users and avoids any of the potential problems with a converted vehicle. Try out different wheelchair vans in person to see which features work best for your situation. It’s worth taking your time deciding on the options you need in a wheelchair van or SUV before investing in one. Get the right configuration on a wheelchair-accessible vehicle, and you can hit the open road with the peace of mind that comes from knowing that you’re in the safest and most convenient van for your needs. Wheelchair vans have many choices for ramps and lifts, safety mechanisms, seating configurations and much more. Knowing what your options are and what wheelchair vans are the best will help you communicate with the dealer.